The desired model output will determine which software package is right to use. If more than one output format is needed, than a combination of multiple software packages may be used. Polygonal and NURBS modeling from 3D scan data and 3D inspection and reporting. Third generation point processing software for creating native parametric "design-intent" CAD models directly from scan data. Advanced 3D modeling, image processing, and measurement software for MRI, CT, PET, microscopy, scientific, and industrial 3D imaging applications. Advanced free-form 3d modeling software for arbitrary triangle mesh creating and processing. CAD-based software for inspection, tool building, and reverse engineering. Create, edit, analyze, and translate NURBS curves, surfaces, and solids. Also supports polygon meshes. Inspection/Analysis software for providing a common platform for product data management. 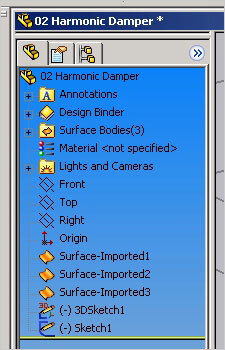 Direct Dimensions has the ability to convert your CAM2 Measure X files into SolidWorks native geometry. As an example, when a measured circle is imported from Measure X into SolidWorks normally, the circle is converted into 2 splines (semicircles). 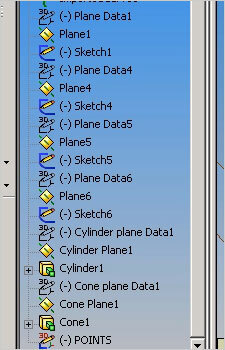 However, using DDI's service, a measured circle is imported as a complete circle on a sketch. Currently, users have had to reorganize and manually recreate Measure X data when it was directly imported into SolidWorks due to incompatibilities and inconsistencies between the two programs. The program separates Measure X data into its respective planes, organizes sketches into appropriate groups, and converts data into proper elements. With automatically organized sketch groups, features are ready to be modified to create 3D models.